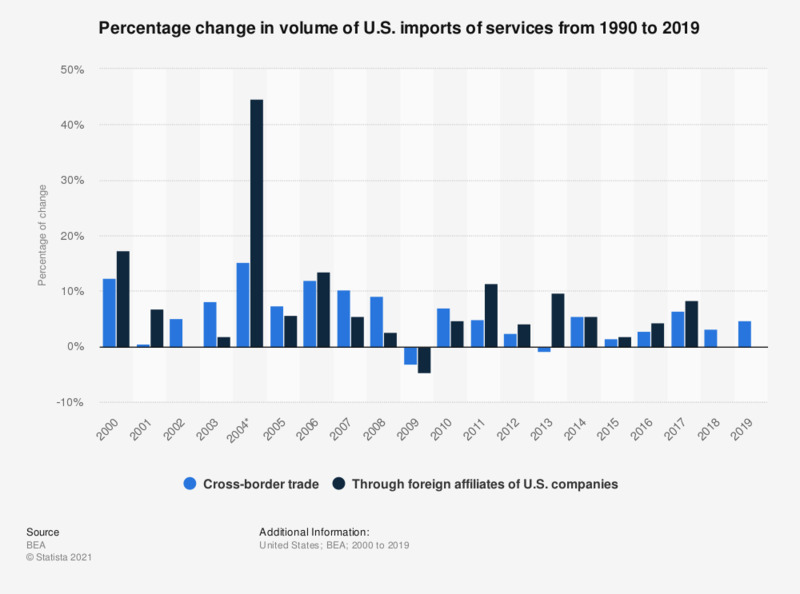 This graph shows the percentage of change in U.S. import volume of services from 2000 to 2017. In 2017, U.S. imports of services via cross-border trade increased by 6.4 percent. There is no data available imports of services via foreign affiliates of U.S. companies for the year 2016. * According to the BEA: Beginning in 2004, services provided by bank affiliates and by the nonbank affiliates of U.S. banks are included in the statistics. Also beginning in 2004, the statistics are presented as "services supplied" rather than "sales of services." Compared with sales of services, services supplied adds 1) wholesalers' and retailers' distributive services, 2) insurers' premium supplements, and 3) banks' implicitly-charged services; it subtracts a proxy measure of insurers' expected losses.